It was in 1972 that Fischer won the World Championship. Three years later, he resigned his title. I was child at this time and could not figure out why he gave up. I still can't. And most chess players don't know either. But I was already attracted (or addicted) to chess. I could not play in tournaments due to schoolwork (I completed high school in three years). My study of the game was limited to books from the library and play was limited to blitz games. 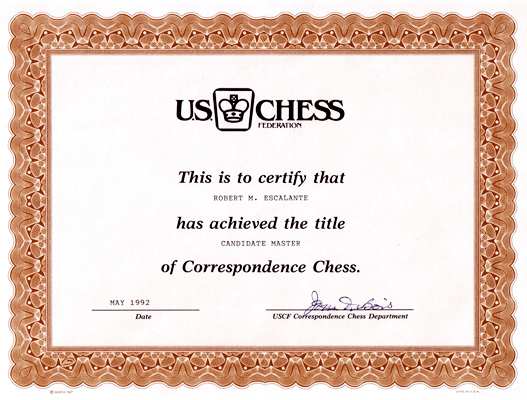 In 1992 I was awarded the coveted title of Correspondence Candidate Master by the United States Chess Federation (USCF). At the same time I also held the title of Expert in the Correspondence Chess League of America (CCLA). My peak rating at www.chess.com is 2352, the highest in any website I've been involved. 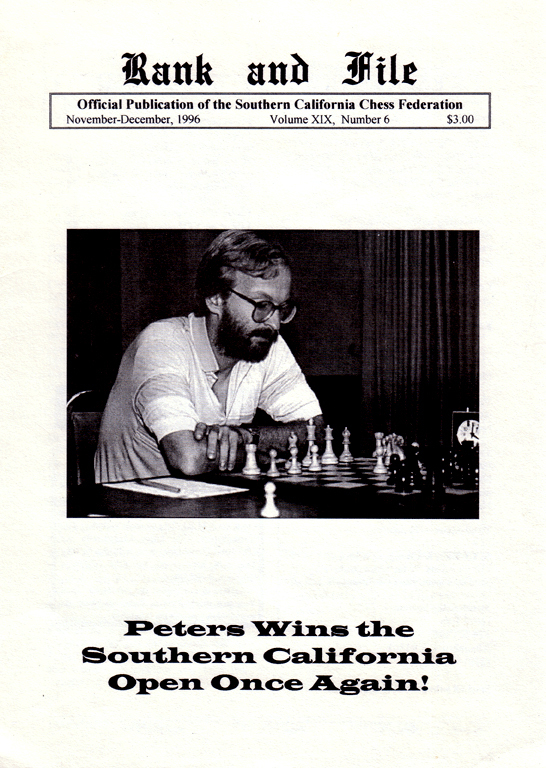 From 1995 to 1997, I was the editor of Rank and File, state magazine of the Southern California Chess Federation (SCCF). Since then I have also pursued other interests in fine art, graphic design, literature, long distance running (5K to marathons) and swimming. This web site is my gift to the chess world. Feel free to browse. You may download any PDF files, PGN game collections, or wallpapers you may find on this website. Enjoy it! It's free, non-polluting, non-fattening, and we use only the best electrons on our website. I am also available for tutoring. Lessons start at $20 per hour. If you want your game analyzed, the rate is $25 per game. You'll get a Word file, a PDF file, and a PGN file so you can showcase your masterpiece in different formats. Please click on SHOW OFF YOUR GAMES button on the left to see short and simple samples. Your game will be more fully annotated.